Tomato Pie Pizza Joint was opened by a New York transplant who—you guessed it—desperately missed the NY-style pizza from back home. So he started his own pie shop, which now has two locations (Silver Lake and Mid-City) and is dishing out thin-crust pizza to homesick transplants. 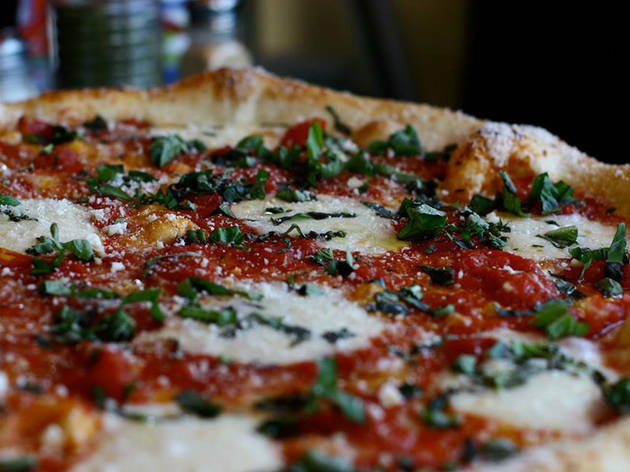 Try the Mr. White, a garlic, olive oil and three-cheese variation, or the traditional Grandma, a margherita pie that is simple, classic, and oh-so New York. Outstanding pizza... and free delivery. What's not to like? I absolutely love the this pizza joint! 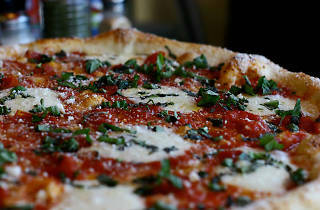 As Kate said, it's a traditional pizza restaurant that offers really fresh pizza! The huge plus for me is that they offer gluten free crust on any of their pizzas! Agree with Michael—since moving here from NYC, this is the closest I've been able to find to a classic New York slice. I just wish they'd extend their delivery radius to include my house! But it's (almost always) worth the trip. This is by far the best New York-style, pizza by the slice place in the city. There's enough variety to the toppings and bases (without going too overboard) that those build your own personal pie places that have popped up seem obsolete after finding Tomato Pie. Most slices hover around $3, depending on the toppings—the Mr. White is one of my personal favorites. It's also one of the few pizza places I've found in LA that actually knows how to cook garlic knots. Hit up the South Pasadena location for a larger space with a fun midcentury vibe.